Our wool Stitch-Along is finally here!!! I am hoping you by now you have received your kit if you have purchased it though Primitive Gatherings. I can’t begin to tell you how much we appreciate the overwhelming response to this Stitch Along. I know most of you have more projects than one person needs but you are still willing to spend your hard earned bucks buying out products…THANK YOU! getting started…tracing , cutting, fusible, Fray check…when to use it? Threading your needle without a needle threader and making a quilter’s knot. 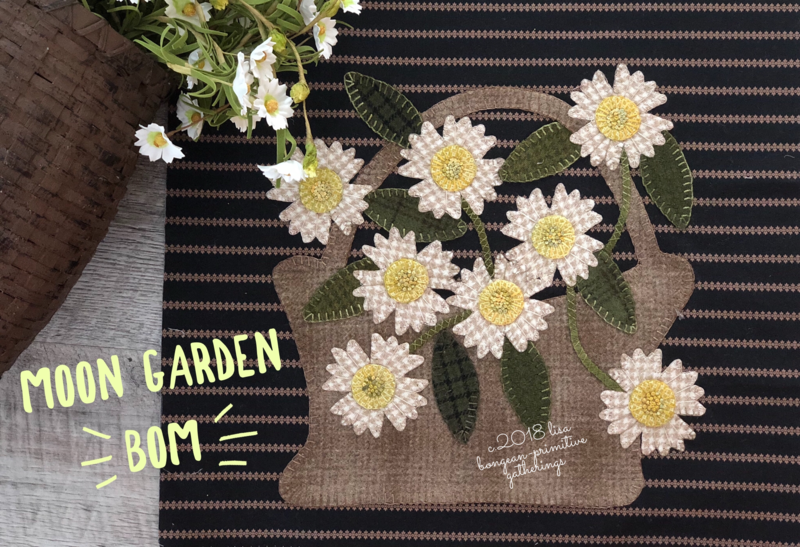 Click here to download Moon Garden Block 1 Update…this block is not longer FREE here…please go to our websit to purchace Block 1…the current block is always FREE until the next block posts…Please subscribe to this blog to not miss a FREE block. 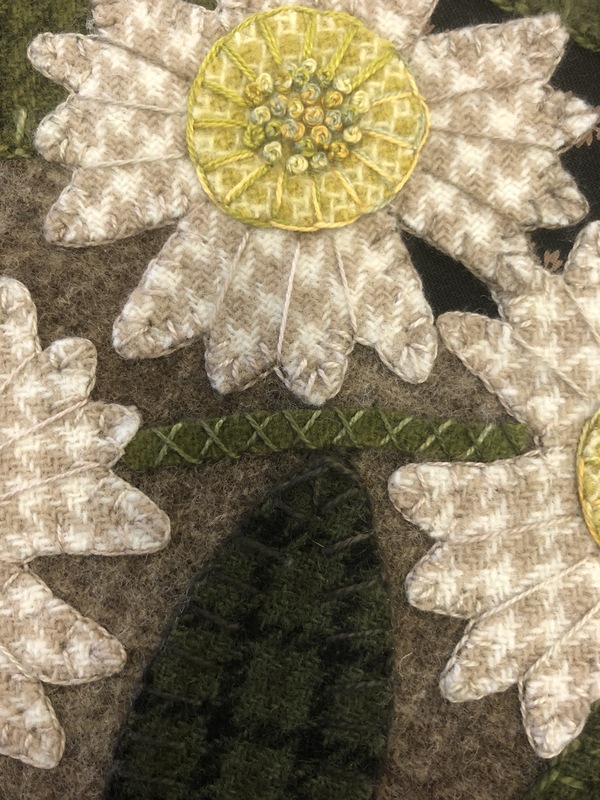 The blanket stitch here includes a long one in the indents of the flower petals. Close up of how I cross over (X) over my stems…these and more will be demonstrated on Facebook. I’m going to FINALLY have time to make my Block ! of MG. I can’t wait. By the way, I’m anxious to try your new fusible when it comes out, although I do like SAS2 and fortunately, do not have trouble with gummy needles. I just wanted to thank you for another great stitch along and really like that you will be doing tutorials on facebook. Looking forward to being able to post a picture of my Block ! when it is done. Thank you so much. Are we allowed to do a smaller version of this? I like SAS2 lite. I don’t have an issue with gummy needles so I must use a lot of steam as well. It adheres the best to any other brands I’ve tried. Are we having a FB. Group for Moon Garden? Hi Lisa — I have been billed, but I have not received my kit yet. I did order it from your shop. How does one access videos when posted, thank you. Dear Lisa, I can’t wait. But I have a problem, I don’t have Facebook…how I’m going to be able to see the videos? I’m at the end of the alphabet with your mailing list. Next time I’ll know to buy the entire kit at once and not on a monthly basis. Lisa, I too haven’t had an issue using sas2L that a little extra steam didn’t cure. I do love the fact it has that little bit of “stickiness” when placing your pieces before you steam, hopefully the new product you come up with will keep the slight sticky feel to make placement before steam helpful. When you do your videos will you show how much fray check to use… i used it on my Sea Star penny mat and it seemed like the cream pennies still frayed especially as I manipulated it to work on, maybe I didn’t use enough fray check. I think this may have also attributed to my blanket stitching rolling up on some of them, or manipulating it a lot did. One note: the larger binding clips to hold the rolled fabric helped to manipulate the star when stitching and I think this also helped the “rolling” blanket stitch (it only seemed to do it on my cream ones so I don’t think it was my technique). Thanks so much Lisa for this lovely free block. Just one comment of concern. You appear to have forgotten to include both your name or the shop on the pattern with your usual copyright date. Or maybe I’m missing something. no…you may just have to have a FB page for your quilting…I am sorry this the only way right now to load the videos and keep them in our group..I know I could do a you tube but those need to be more professional and costs lots of money..
Lisa, I’m sorry to ask about the videos again, I don’t have Facebook. Thanks Lisa, I understand your concern about the videos all over. I will try to do my best with my Moon Garden blocks. Hi, Lisa! I haven’t done a stitch a long in awhile so when this popped up that you were doing one, I signed up! I’m so excited about it! Since I live in Virginia and haven’t been able to take classes, I am looking forward to seeing and hearing your tips on making my appliqué better. I just got my kit in the mail yesterday. I hope I have the colors of thread that I need…if not there will be an emergency call. Lol. The SAS2L I have a love/ hate relationship with! I have always used lots of steam after I read that and it certainly was a game changer, but did not know about the resting. Will have to try that as well! Thank you for always being willing to share what you know, and having people at your shop that are helpful, quickly responsive and kind when I call. Looking forward to this! I received my pattern and kit, but not the background fabric that was to come with it as I had ordered. Looking forward to starting this block, hopefully I will get the background fabric soon?? It’s coming i am sure…we are not holding it hostage!!! I am not on Facebook. Can I get your blogs by email? Or how? This is going to be my first wool project, and I am really looking forward to it and excited to start. Love the new banner photo on the blog! Dare I hope those are a new fabric line? Please say yes! Lol! YES!!! I am working with them right now!!! 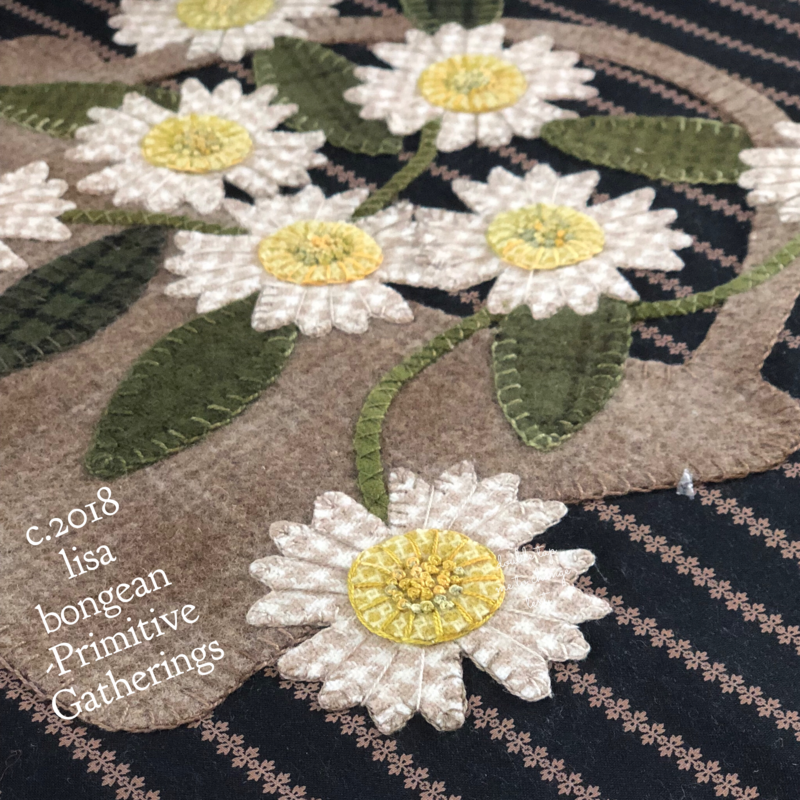 The fabrics for moon garden stitch along have been in the shop already…Little Gatherings II We do not have any left as Moon Garden has been a huge success!! !